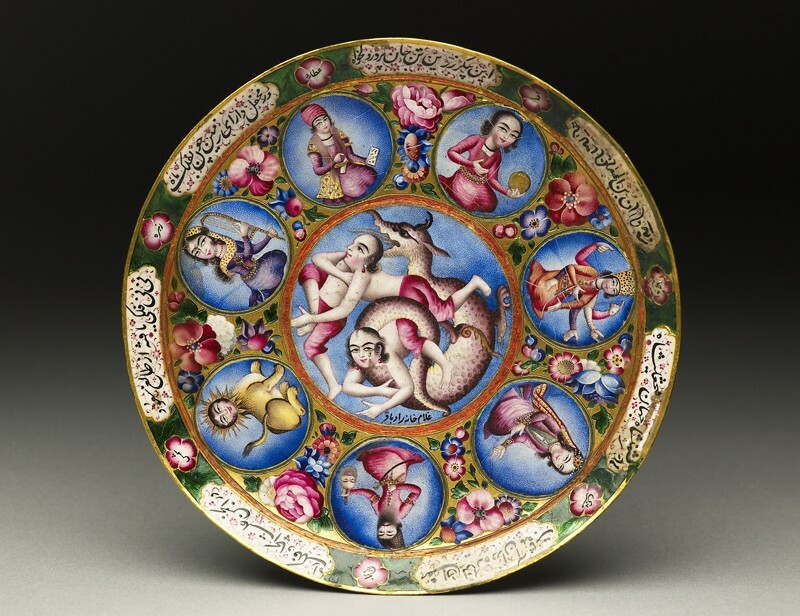 The art of enamelling on precious metals, which had enjoyed increasing importance in Iran under the Safavids (1501-1722), received lavish patronage during the Qajar period. Water pipe bases, swords and daggers, mirrors, and snuff-boxes are some of the types of objects which were painted with enamels. Numerous signed and dated pieces survive, many of which date to the times of Fath ‘Ali Shah, the Qajar ruler of Iran from 1797 to 1834. This whole set [EA2009.2, EA2009.3, EA2009.4] is decorated with cycles of astrological symbols and figures. The twelve signs of the zodiac and the six major constellations are depicted on the body of the bowl, the animals of the Far Eastern zodiacal tradition on its lid, and the seven planets on the saucer. Tiny inscriptions identify the images on the bowl and those along the rim of the saucer, while the animals on the lid are named in the lines of poetry beneath them. Two crowned heads and human-faced suns decorate the front and back of the spoon, and a human-faced sun also appears in green enamel on the back of the saucer. Lines of poetry arranged in cartouches around the rim of the saucer dedicate this set to Fath ‘Ali Shah. The inscription below the image at the centre of the saucer bears the name of the enameller, Baqir, preceded by the title ‘slave born in the household’. According to Basil W. Robinson, who worked extensively on Qajar material and published this set in some detail, this formula should be understood as ‘artist of the royal workshops’ or ‘in royal service’. Baqir was one of the leading enamellers at Fath ‘Ali Shah’s court. Very few enamelled pieces signed by him are known to survive to this day, and nearly all of them belong to the collection of the Imperial Crown Jewels of Iran, in Tehran. A high level of detail and a bright palette characterize the production of this period. The enamellers’ skill is further emphasized by the typically small dimension of these works – the saucer of the Ashmolean set measures only 12.7 cm in diameter. Accepted by HM Government in lieu of Inheritance Tax on the Estate of Basil W. Robinson and allocated to the Ashmolean Museum, 2009.